At Granta our strong passion for automation is fuelled by the fact that as we open up new opportunities with innovative automation, we are strengthening the heart of the UK's economy, and making a positive contribution to many people's lives. 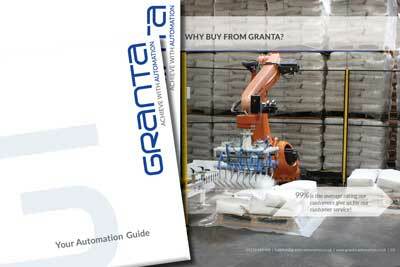 At Granta we have the vast range of knowledge, experience and skill you need to help you take your automation projects to the next level, and get results above and beyond expectations. Whatever your automation project is, from a single small control panel to a complete robotic production line, you will find our helpful, customer focussed, and straightforward approach will enable you to quickly and successfully achieve your goals in the most cost effective way. You can trust Granta for quality projects that are guaranteed to work due to our many years of experience and a wide range of skills; from basic engineering and panel building, to robot and plc programming. We constantly strive to bring you the latest technology and innovations from the world of automation, and our team of automation engineers, automation consultants and experienced technical support staff are regularly trained to keep ahead in the fast developing world of automation. With Industrial Revolution 4 knocking on your door and ours, the world is changing rapidly and many more automation possibilities are open to us than ever before. We love the fact that our automation has helped many people achieve new successes, jump ahead of their competition and stay at the cutting edge of their industries. If you are a manager looking to improve your production process, or a manager/engineer tasked with looking into an automation project, then you are definitely in the right place. Browse our website or contact us today for help, advice and support with your project. We are helpful to all, with a positive attitude of respect, humility and happiness. We are proficient, highly skilled and competent in all we do. We hold integrity, honesty, loyalty, meeting promises and high product quality as key reliability standards. We are quick and efficient in thinking, responding and producing results, but not at the expense of quality. We have the worlds first online project builder, try it now!